This is fourth part in our series of articles taking a deeper look at the blaster statistics available in the iSoaker.com database. Read up on Part 1, Part 2, and Part 3 if you haven't done so already to get more background on the insights presented below. In Part 4, we'll begin looking at some trends or lack thereof in stock water blaster statistics. As noted in the previous articles, we will be using dry weight as the base ruler upon which the rest of a water blaster's features are rated against. As it seems, the dry weight number is a quick way to get a sense of what a water blaster may be capable of since it is affected by water blaster size and types of internal components. While filled weight would give a user a better sense of how heavy a blaster is when in use, the advantage of using dry weight as the base for comparison is that we can now look at how efficient in hold water different blasters are for their weight by looking at how much the weight increases (it is less intuitive for people to try to think about how much weight is lost). Plotting these number, we get the following graph. Immediately, we can see that most water blasters hold at least their own weight in water. There are a few that don't quite have the capacity to match their dry weight, but most do. Moreover, a good number of water blasters hold more than twice their weight in water. These blasters are obviously making more efficient use of their weight to water capacity. For your average water blaster, it seems that holding your weight in water is good, but holding double or more is definitely possible and, from the point of the user, highly desirable. It is interesting to note that the Super Soaker blasters that use CPS-tech are all on the upper-right part of the graph, meaning they are both heavier in dry and filled weights. The above graph is just an enlarged view of the graph showing blasters 2000g or less. Of course, capacity is only part of what users want from their water blasters. Having lots of water is good, but if output or range are limited, all that water loses its usefulness during a water war. Another point of comparison for water blasters is to look at their range versus dry weight. Plotted below are the ranges for all the nozzle settings for Super Soaker, Super Soaker CPS-tech, and Water Warriors water blasters. 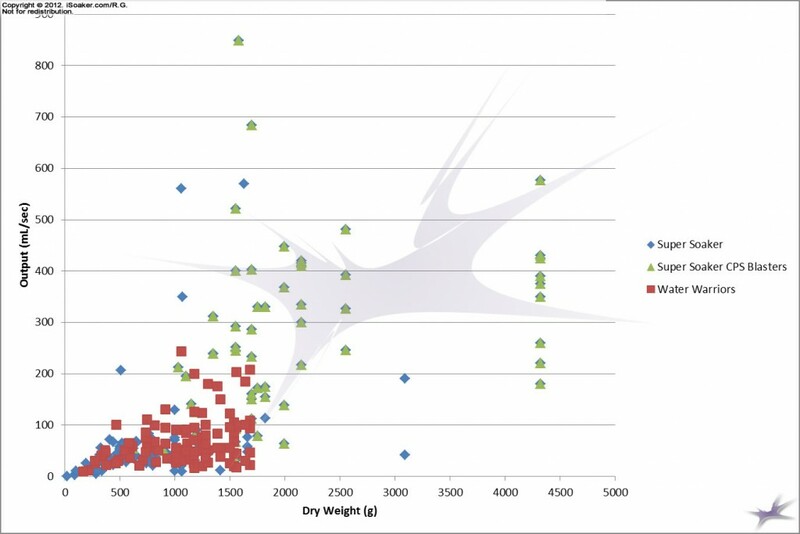 In this case, there is not any particular apparent correlation between dry weight and range achieved by various water blasters. What can be said is that most stock water blasters seem to achieve between 8m - 12m with the majority clustered around the 10m (~30') mark. The only semi-significant finding in this case is that the Water Warriors brand of water blaster seem to have generally better ranges for their weight than the Super Soaker brand, but this is not quite definitive since the Water Warriors brand is both younger and does not have as many water blaster models available for comparison yet. 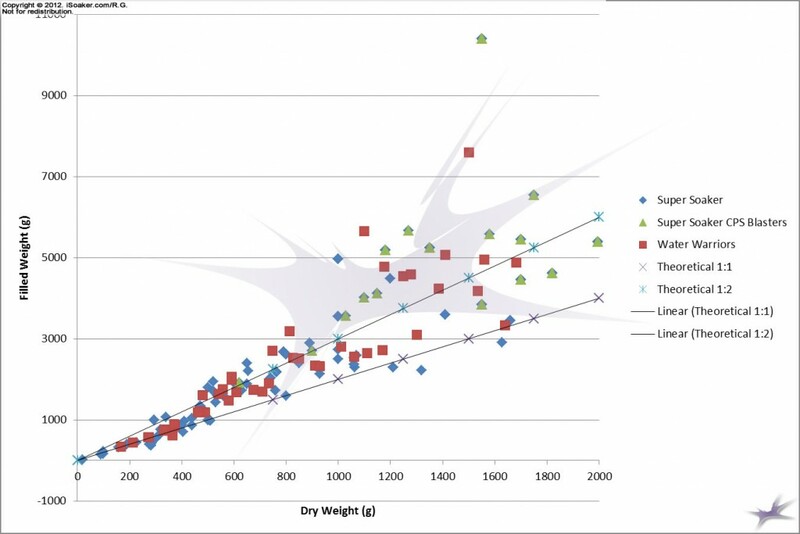 The last comparison we'll look at for now is comparing stock water blaster dry weight to available nozzle output. The graph below shows the results of this comparison. In this case, there are some interesting trends. As expected, larger (heavier) water blasters tend to be able to produce larger outputs. As larger water blasters also tend to have nozzle selectors, this explains why many points for heavier water blasters are on the lower end of the output scale. However, just looking at the greatest output point for every weight, there is a general upwards trend. Not surprisingly, the CPS-based water blasters from Super Soaker all have significantly higher outputs (even the lowest outputs tend to be on the high side) versus air pressure and even Water Warriors Hydro Power systems. This just confirms general knowledge and desire by users to still seek out old CPS-based blasters; the CPS-series really do perform significantly better than all other blasters made to this day. I should note that the high points on the graph that are not labeled as CPS are water blasters using the CPS tech (namely the Super Soaker Flash Flood and Super Soaker Arctic Blast), but not considered as part of the classic CPS-series. While those particular blasters have rather high maximum output, these blasts are very short both in time and in range. 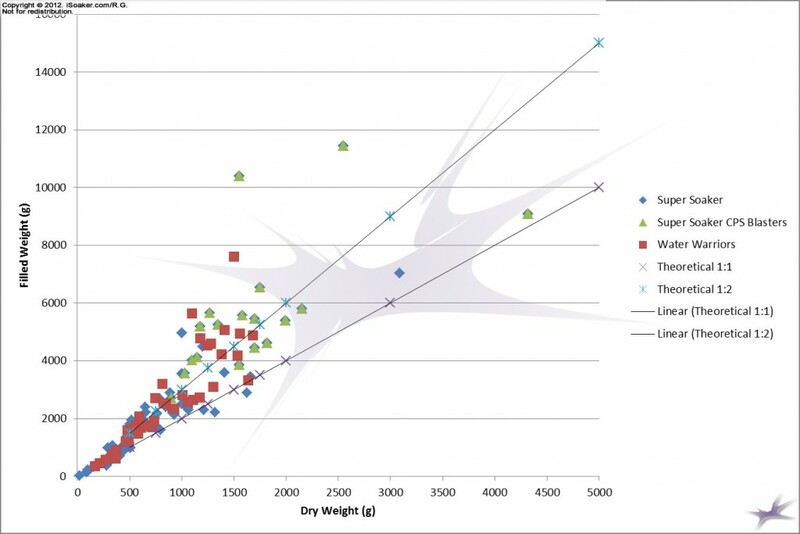 The above graphs show that stock water blaster dry weight makes for a good scale upon which other comparisons can be done. 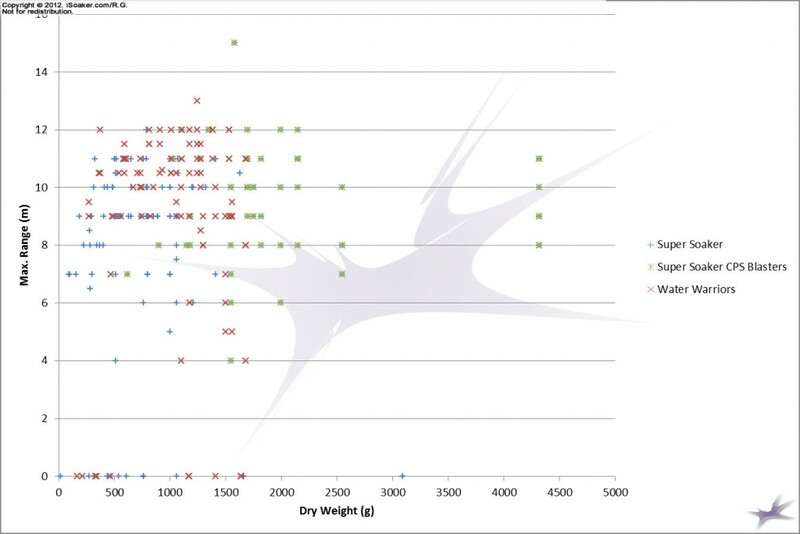 With most water blasters falling below the 2000g mark, blasters of different weights have notably different expected levels of performance both in terms of output as well as in terms of available water capacity. What is also interesting to note, though not surprisingly, is that the original CPS-class of water blaster by Super Soaker performs significantly better for their weight than their air pressure or even Hydro Pressure counterparts. The fact that presently only Hasbro Inc. can make CPS-based blasters due to their patent and current injunction against Buzz Bee Toys Inc., but that Hasbro Inc. seems currently focused on non-pressurized water blasters does not bode well for the probability of seeing true CPS-type performance in the near-term. Here's to hoping that Hasbro Inc. starts making use of its patents or that some new way is found to increase the performance found in air-pressure water blasters.